Step 1. 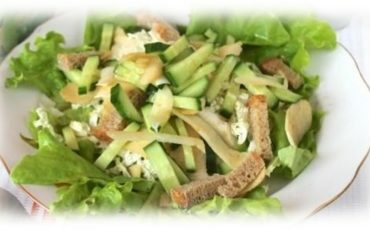 To cook the salad you need to take green salad and cabbage leaves, cucumber, celery, an apple, cheese and rusks. Step 2. For the salad dressings you will need soy sauce, cedar oil and lemon juice. Step 3. Tear or cut (preferably with a ceramic knife) green salad leaves into 4-6 pieces. Step 4. Put the cut leaves in a wide bowl. Step 5. Cut a cabbage into thin strips. Step 6. Put the cabbage strips onto the salad leaves. Step 7. Cut the Cucumber into cubes and apple into chips (with vegetable peeler), sprinkle it with lemon juice. Step 8. Put the apple chips on the cabbage. Step 9. Then the cubes of cucumber and celery. Step 10. Grate the cheese over the salad. Step 11. Mix the ingredients for the salad dressing and stir well. Step 12. Fill the salad before serving, rusks can be served separately.